Examining today’s economy as a whole, 55-65 percent of bill payments are conducted online through a biller’s website. Electronic payments are the top choice among consumers, with paying by mail or in person becoming less frequently selected options. But when the economy is viewed by industry sector, it becomes clear that property management turns that trend on its head. Property management is largely an in-person or pay-by-mail industry, meaning businesses tend to receive high paper check volumes. Many property management companies have not yet created a web portal to accept customer payments online. That becomes a challenge when more consumers want to make electronic payments, a shift supported by the U.S. government’s campaign to electronify payments by 2020. What appear to be quick fixes in the payment solutions marketplace can actually cause more harm in the long run for property managers. Many existing platforms are not designed with property management in mind, lacking the ability to easily manage payments for multiple properties. The investment in developing custom software can be prohibitive, let alone navigating payment card industry (PCI) compliance and data security. Instead, businesses should choose a highly secure, affordable electronic bill presentment and payment solution developed by a trusted technology partner. With the evolving payment habits of today’s consumer in mind, CheckAlt’s software engineers and compliance experts created the premier electronic bill presentment and payment solution on the market, KliknPay. KliknPay is a flexible web portal that allows property managers to view summary statements, and to securely accept online payments from any bank account, or by credit or debit card through a mobile device or desktop computer. KliknPay’s features make it easier for both property managers and tenants to manage how and when payments are made. For example, users who pay for multiple units can easily make separate payments from a single user account. And, with one click, the web portal can be translated into Spanish, helping property managers effectively communicate with Spanish-speaking tenants. Another feature of KliknPay is the ability to set custom controls over how payments are processed. For example, property managers can provide CheckAlt with a digital stop file, or a do-not-process list, with the names of tenants under eviction. This tells our system to not accept payments that may void an eviction. 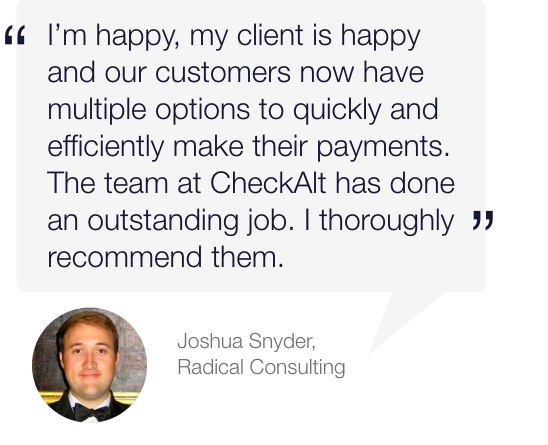 CheckAlt is mission-driven to help businesses like property managers convert paper payments to electronic. Part of that mission requires dispelling the idea that paying by check is more secure than electronic payments. Consumers are increasingly concerned with cybersecurity regardless of age, having seen news reports of large data breaches happen at companies as large as Equifax, PayPal, and eBay over the past several years. In that context, a property management companies should seek expert assistance to secure its own online payment portal. CheckAlt prioritizes cybersecurity with all of its integrated payments solutions including KilknPay, and is trusted by more than 600 financial institutions across the United States to keep payments safe. Generationally speaking, Millennials and Gen X tenants are more likely to make digital payments since the propensity to use electronic goes up as the customer’s age goes down. Baby boomers and older consumers tend to be slower to convert to digital, until they realize how secure a web portal with 128-bit encryption is compared to a piece of paper with a signature, routing number, and account number, placed in an envelope in the mail. KliknPay is designed to meet PCI standards and encrypts all payments, protecting highly valuable consumer data. Even so, some tenants will continue to pay by check, which is why many property managers choose CheckAlt’s integrated receivables solution suite to collect and manage all transactions—regardless of payment method or channel—in a centralized, digital hub. KliknPay is part of that product suite, which includes paper, remote, and electronic lockbox processing. Getting started with KliknPay for property management is simple. It starts with CheckAlt helping the property management company gather the necessary requirements for development, and then setting up credit or debit card processing as desired. KliknPay can be up and running in a matter of weeks. Contact us to find out how your business can begin accepting payments online using KliknPay.